“The Lego Movie 2: The Second Part” faced a challenge perhaps even more daunting than its predecessor. Lord & Miller's “The Lego Movie” took a concept that seemed doomed to remain bogged in its own sticky overcommercialized origins, and turned it into a lively, funny, and – dare I say – intelligent meta-narrative about the importance of childhood play; “Lego” never loses sight of the fact that its central characters and all the sets are merely little hunks of Danish plastic. In making a sequel, not only would the filmmakers have to find a way to keep the jokey, ultra-slapstick intact, but they would have to find a way to expand on the original movie's self-aware concepts: What more can be said now that we know that we're watching a story of a young boy playing with his toys? 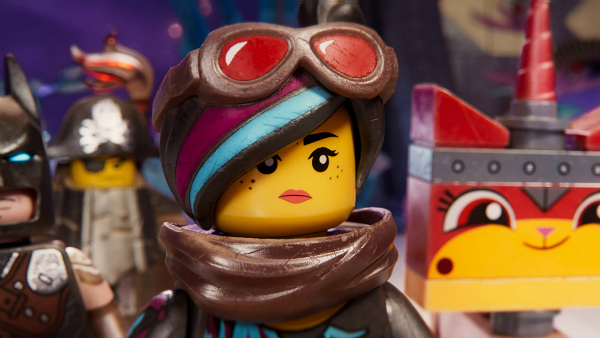 It's astonishing how well “The Lego Movie 2,” now directed by Mike Mitchell (“Trolls,” “Sky High”), succeeds on both fronts. 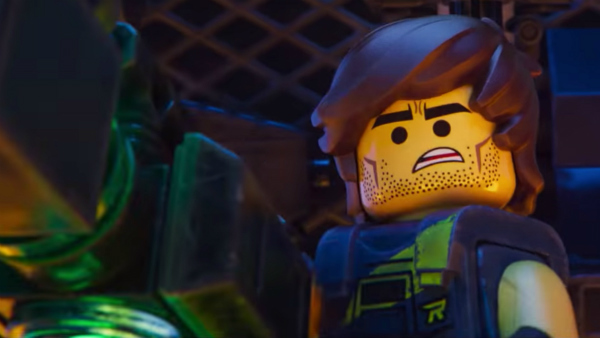 The Lego movie series – which also included a Lego Batman movie and a film devoted to the Lego Ninjago line – has expertly codified a specific type of nutty, cheeky humor that sounds like a kid-friendly echo of Zucker, Abrahams, and Zucker spoofs. When the world is made of reusable bricks and plastic characters can't suffer damage any worse than painlessly losing a replaceable limb, the stakes will remain comfortably low, the drama comfortably silly. “The Lego Movie 2” is just as playful as ever, satirizing the clichéd seriousness of action movie tropes by undercutting them with literal giggles and smiling friendly talking valentine hearts. Just as in the first “Lego Movie” there are two stories working simultaneously in “The Second Part.” In the world of toys, the land has been reduced to a dark, post-apocalyptic Hellscape, undone by the constant invasion of aliens. When Wyldstyle (Elizabeth Banks) is kidnapped by the perhaps-evil Queen Whatevra Wa-Nabi (Tiffany Haddish) and taken away to the Sistar System, it's up to clueless Lego man Emmett (Chris Pratt) to travel there to save the day. Along the way, Emmett teams up with one Rex Machete Ninjastar Dangervest (also Pratt, now sending up his action movie career) to blow up the Sistar Castle before the Queen marries Batman (Will Arnett, slowly becoming this generation's best Batman). Oh, and be sure not to miss the broody romantic vampire. The external narrative is, of course, that a teen boy's little sister has stolen his toys and is constantly invading his evolving headspace. He resents that she's not using his toys to play in a more “mature,” (read: action movie) fashion. We see glimpses of the humans' fight in brief, live-action flashes, and will eventually get a cameo from mom (Maya Rudolph) who will threaten to banish the toys to an alternate dimension. Er, storage bin. “The Lego Movie 2,” however, is more than a movie about a brother and a sister learning to play. It's a sharp and intelligent criticism of the way American audiences have come to view action cinema. The dominant ethos of mainstream action movies has been to add grit, to make them harder-edged, more action-packed, and much, much “cooler.” The main characters in the vast bulk of entertaining comic book movies and high-octane 'splode-fests tend to be unstoppable action machines, unflappable in extreme situations, skilled at doling out violence to mobs of faceless attackers. These types of characters may provide thrills, but their dark, callow faces lie just below the surface. Action movie heroes are experts in doing harm, and audiences do not seem eager to watch them take part in diplomacy, togetherness, or forgiveness. Of all the sources to hear this message, “The Lego Movie 2” somehow saliently deconstructs the very notion of what adolescent boys consider to be mature. One's desire to be unemotional, to hurt others, to live alone, to be “cool,” these are all toxic concepts in the eyes of “The Lego Movie 2.” This is a sweet, funny, fast-paced kiddie flick that – am I seeing this right ?– seeks to undo a young male's need to dominate and suppress a female voice. It is confronting the very origins of toxic masculinity. Meanwhile, the girl's games are about singing songs, togetherness, marriage, and joy. Superior qualities to be sure. I would consider “The Lego Movie 2” to be a feminist work. “The Lego Movie 2” is a vibrant, funny, and unexpectedly expansive chapter in one of the unlikeliest film franchises currently operating. The jokes are hilarious, the pace is excitingly breakneck, the obscure references are on point, and the messages will not be lost on the little ones. These little plastic bricks have something to say.